If I was going to roast garlic, I might as well cover some in chocolate to put on top of garlic cupcakes. Put each garlic head in foil and place them in a cupcake tin, as shown above. Drizzle a couple teaspoons of oil over each head, using your fingers to make sure the garlic head is well coated. Drizzle each head with honey. Close the foil over each head. Bake at 400 F for 30-35 minutes, or until the cloves feel soft when pressed. Melt the chocolate chips with the butter in a double boiler or the microwave. Dip each clove of garlic in chocolate. I thought it looked best to only cover half of the clove. 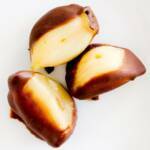 Place chocolate covered garlic on parchment paper and place in the refrigerator to cool.